It’s travel season, and I know many of you are headed to Italia this summer to take in the sights. 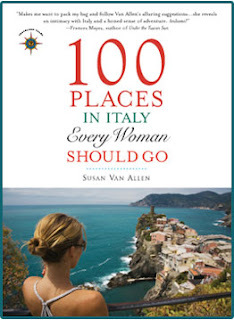 Author Susan Van Allen has a new book you’ll certainly want to take along with you: 100 Places in Italy Every Woman Should Go (Travelers' Tales) . Charming, funny, helpful, and filled with passion, 100 Places is the best kind of travel book: both guide and storyteller. But then Susan is a natural storyteller who has honed her skills writing for television shows like Everyone Loves Raymond and news outlets including NPR and CNN.com. AKN: You come from an Italian-American family. When did you first visit Italy? What was your trip like? Susan Van Allen: I grew up hearing all about Italy, tasting Italian food, and feeling that overwhelming Italian affection from my maternal immigrant grandparents, during long Sunday dinners at their house in Newark, New Jersey. Italy absolutely intrigued me. So I saved up money from high school jobs (babysitting, working at the Pancake House and Dunkin’ Donuts) and got to Rome in August of 1976—with a pack on my back, a “Let’s Go Italy” under my arm, and a bursting anticipation. Now anyone who knows anything about Italy knows that August in Rome is ridiculously hot and notoriously the worst time to be there. This August was no exception. But I didn’t notice—it was a thrilling initiation: my first time looking up at the Sistine Chapel, first taste of gelato, first time getting my bottom pinched, and meeting my Italian cousins. The cousins sat me down at their dining room table and surrounded me with the same delicious food and affection I’d had as a child in my grandparent’s New Jersey dining room. Then and there, Italy captured my heart forever. AKN: Why is Italy a great place for women to visit? Susan Van Allen: What I found fascinating when I was writing 100 Places in Italy Every Woman Should Go (Travelers' Tales) and talking to women about why they were attracted to Italy, was that they’d always say: “It feels like home.” I understood this coming from Italian-Americans like me, but it also came from women who didn’t have a drop of Italian blood in them. So my take on it is this: Italy is home to women in the larger sense—it’s a country where they feel understood and appreciated, a place that feeds their soul. How does it do this? First there’s the deluge of sensual pleasures which seduces both sexes, opens every traveler’s heart, and embraces them. And then women find something special about this embrace—they find themselves in a culture that adores women. There’s the surface level of adoration that comes from the handsome Italian men, who’ve elevated the art of flirting to one of Italy’s many masterpieces, and show their appreciation to all females—from baby principessas to nonnas. But the adoration I’m referring to goes even deeper. Everywhere we go when we travel in Italy we’re surrounded by divine female images—from Venus, the Goddess of Love and Beauty, to the Madonna, the Compassionate and Abundant Mother. The whole spectrum of the female psyche is adored here, and has been adored here for thousands of years. No wonder women love it so much! AKN: What Italian city speaks to your heart most? Why? Susan Van Allen: What a challenging question! It’s a toss up between Rome and Venice. I always feel embraced in Rome by the generous, pleasure-seeking spirit of the Italians and I’m awestruck by the layers of history there—from the ancient ruins to the modern museums. And then there’s Venice—a place that defies categorization. It embodies the true magic of Italy—the fact that it still exists is miraculous! The moment I touch down there I feel swept into an Italian fairytale. AKN: Americans and Europeans have tried to replicate so many great things about Italy -- the architecture, the food, opera, fashion... What is one thing that you love about Italy that you just can’t find anywhere else? 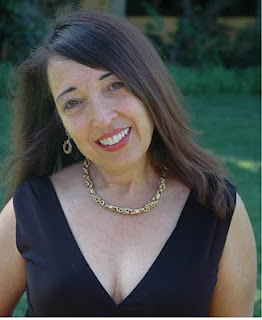 Susan Van Allen: I always come back to the USA pining for Italian tastes. It’s hard to find guanciale (pig cheek) here—the special ingredient that brings such a distinct flavor to the Roman Pasta all’Amatriciana—most restaurants here substitute pancetta. There are also wonderful liqueurs, especially ones made in the south, that use combinations of herbs or cinnamon or fennel that are rarely imported. I love to buy them and have them around to give a beautiful finish to my dinner parties in Los Angeles. AKN: Italy is all about food. What is the best meal you’ve ever eaten in Italy? Where? Susan Van Allen: Again, I’m challenged, because I’ve had so many amazing meals in Italy! One that springs to mind is a lunch in Ravello (a village above the Amalfi Coast), at Mamma Agata’s Cooking School. Mamma Agata is in her seventies—as a child she worked in a wealthy woman’s villa and cooked for American celebrities who fell in love with her dishes—such folks as Humphrey Bogart, Jackie Kennedy, and Fred Astaire. Today she has a cooking school at her family villa which has an amazing view of the sea, perched on a cliff over her terraced gardens. The class is mostly demonstration, and we watched her transform what grows in those gardens into a delicious lunch. When we sat down—at a long table in a shaded pergola with that amazing view—the combination of the setting and the food took us into culinary ecstasies. The meal began with rolled eggplant appetizers, eggplant parmigiana, and then pappardelle with sausage and peppers, lemon chicken, and lemon cake followed. It was all accompanied by wine from her vineyards and ended with her homemade limoncello. Strepitoso==Amazing! AKN: Your book is for women travelers, but what can male readers take away from it? Susan Van Allen: Male readers are loving this book! In general, it guides readers to places that are appealing to both sexes, in a very entertaining and practical way. Okay, there are a few things that probably won’t interest men—like places to get great hair cuts in the major cities and handmade lace shops--but surely they’ll enjoy finding out about the Venus of the Beautiful Buttocks in Naples, Italy’s best wine bars and jazz clubs. AKN: What surprised you as you were researching your book? Susan Van Allen: I always knew that Italy was a country full of feminine appeals, but what I loved learning while researching it was the fascinating feminine basis of these appeals—it’s everywhere! Of course there are the great stories of goddesses, saints, and the Madonna, who’ve inspired masterpieces. But also, for example, I found female connections when I was researching Italy’s best places for chocolate. I learned that it was a Savoy Queen, Madame Reale, who in 17th century Turin gave the approval to a baker to serve chocolate to the masses—before that time chocolate was a specialty reserved for the nobility and priests. AND going deeper into chocolate research, I learned that Baci, that chocolate/hazelnut treat we love, was invented by a woman in Perugia in 1922. And that these days Italy’s top boutique award winning chocolate maker is Cecilia Tessieri, a gal who has rocked the candy world with what she’s created for Amedei, the award winning company she co-owns with her brother. AKN: The impossible question: you only have one day in Italy. Where do you go? What do you do? Where do you eat? Susan Van Allen: Gasp--That is impossible! But I’ve been getting this question a lot--ever since my first book presentation some months ago, so I’ve had to face up and answer it. Honestly, my response is always different, because my mood is my guide…So today, as I sit here in Hollywood, I’m thinking about being in Rome for this spring day. I would wake up at an apartment I love to stay in, that’s right off the Campo dei Fiori. My favorite place to indulge for a morning cappuccino around there is the Caffe Farnese, that overlooks the Michelangelo designed Piazza Farnese. The Campo dei Fiori market will be opening up and it’s lovely to wander around the food stalls, enjoying the sights and the smells of what’s in season—I’m sure this time of year there will be fragoline—wild strawberries from the nearby forests. I’d drop in at the Campo dei Fiori’s Forno for a pizza bianca (white pizza) that Rome is famous for. Then I’d cross the Ponte Sisto to Trastevere and wander up Via Garibaldi to the Janiculum Hill. The views up there of the domes of Rome are beautiful. Coming back down I’d stop in at Santa Maria in Trastevere, to admire the church’s mosaics in the bright morning light. For lunch, I’d choose Ai Balestrari, right off the Campo dei Fiori, and enjoy spaghetti cacio e pepe and puntarelle salad. I’d take a break as the Italians do, then I’d be off again to the Pantheon before sunset, to stand under that dome and look up at the oculus that opens to a dramatic view of the Roman sky. For dinner I’m thinking Armando al Pantheon…starting with that appetizer specialty they have that features a quail egg and black truffle shaved over it. Maybe I’d have the baby lamb chops they do so well, and end it with their delicious torta di nonna. After dinner I may even head up to the bar at The Hassler for a nightcap—it’s one of the most romantic bars in all of Italy. Plus I’d get another great view of the Eternal City from the Spanish Steps. AKN: Many thanks, Susan! And congratulations on your new book. Check out Susan's blog and website for news about upcoming appearances. And if you would like to purchase 100 Places in Italy Every Woman Should Go (Travelers' Tales) , you’ll find it in The Gypsy’s Store or your favorite independent book store.